Champion distributes industry leading Brelko belt products. 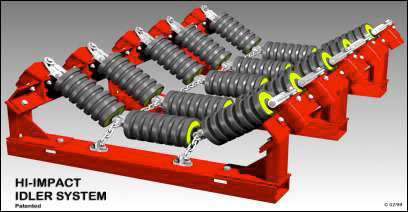 This system has been developed to be used in conjunction with garland idlers to absorb large impact loads due to the transfer of very large lumps of material. Mechanical damage to conveyor idlers, cradles and supporting structure are thus greatly reduced or eliminated. A load point belt support system designed to offer maximum impact absorbing capabilities. Suitable for all Belt Conveyors where large particle size and severe impact load conditions occur. Unique torsion arm mountings absorb impact loads and are self damping. Rubber disc impact rolls help to extend belt life. Support frame is available in standard 2000mm length and fitted with 5 strings of idler rolls, 3 roll or 5 roll. Support frame is designed to replace existing roller cradles and is fixed to conveyor stringers. Open construction makes clean up of spillage and roll replacement easy. Garland idler roll arrangement promotes correct belt tracking.